Sometimes things simply do not work out. About a couple of weeks ago, after giving it a lot of thought which rose I might put there, I planted 'Mme. Ernest Calvat' in a big hole in between this group of Queen Anne Palms (see photo below). I was so excited about this that I even did a whole blog post about it. If you want to see it click here. After looking good for a short time the rose started to rapidly decline. 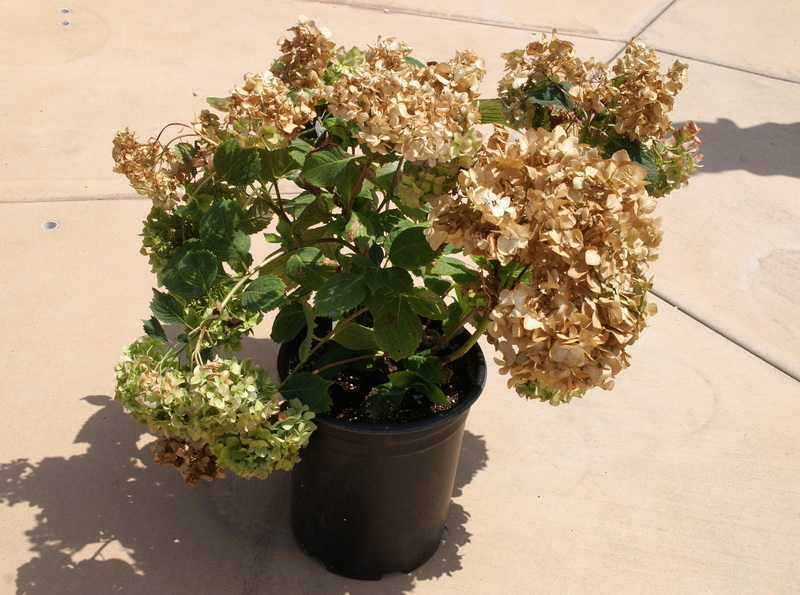 It stopped opening the already existing buds, leaves were turning brown, even whole canes looked more and more brown and black, as if they were dying back. Knowing that the palm roots will shoot back into the planting hole very quickly I realized that the rose would not have much time to recover before it had to deal with severe root competition. So I did not want to "wait and see", but decided to take it out and replace it with another rose out of my rose pot ghetto. This is one of the rare moments when it is actually a good thing to have a big pot ghetto, since you can pull other roses from it if needed. After again quite a bit of thinking I decided to go with 'Georgetown Tea' this time. Initially I had some doubt to plant a tea rose in a spot where it gets partial shade at certain times of the day, but considering Georgetown Tea's petals which are very thin and fried when we had some real hot days lately I am now assuming that for this particular tea rose a little bit of shade at the hottest time of the day might be even a good thing. This rose is another generous rose gift from Masha, a befriended Rosarian, who also writes a great garden blog (if you want to have a look at her blog please click here). Thank you so much Masha for this lovely rose! I am so glad that I finally got it into the ground. 'Georgetown Tea' is supposed to be a very vigorous rose and to become tall. That is exactly what I want from a rose in this spot! Out came 'Mme. Ernest Calvat' and in went 'Gerogetown Tea'. The whole area looked immediately better. I also realized that 'Mme. Ernest Calvat' has quite some dark leaves, which are very nice, but do not show off that well against the dark soil in this location that is partly shaded by the palm fronds. 'Georgetown Teas' leaves are a lighter green and look more fresh in this setting. I liked it much better in this spot than 'Mme. Ernest Calvat' the moment it was in. On the photo below you can see 'Georgetown Tea' a little closer. Isn't this a pretty rose? 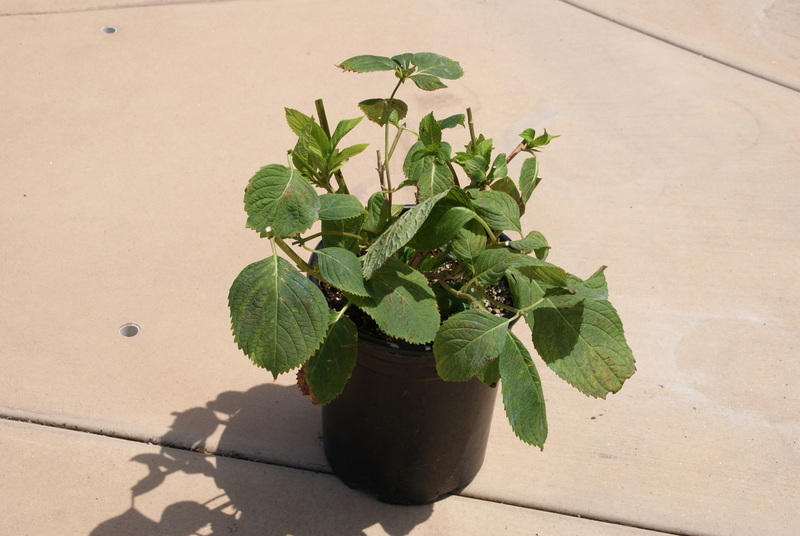 'Georgetown Tea' is in the ground now for around three weeks and it is doing fine. First it opened all the flowers that were on the bush (as shown on the photo below) when I planted it and just four days ago I spotted new active growth. Yay! I am crossing my fingers that this time things will work out! 'Mme. Ernest Calvat' looks worse and worse despite the effort to rescue it by potting it up again. I think it is very likely I will loose this one, which is really sad since it also is a really beautiful rose and it was a gift from a befriended Rosarian, too, which makes it even more precious. Another little project I have been working on is to improve the look of the banana-shaped bed in the front yard. 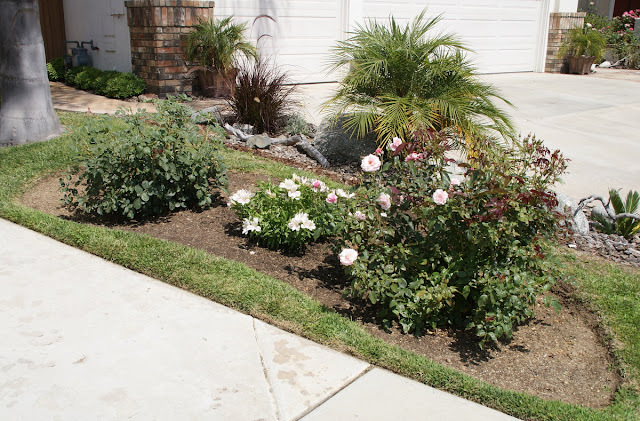 There was a big gap between the two roses, since I took out 'Burgundy Iceberg' a floribunda rose a long time ago. 'Little Miss Sophie', the new alstroemeria that I bought recently found a home in this bed in the front yard recently. I am still in love with this plant. The white color of the blooms with the very blush pink stripe in the middle of the petals is so much more to my liking than the bold colored alstroemeria varieties. I hope it will mediate between the lavender color of the 'Sweetness' rose to the left and the light pink color of 'Our Lady of Guadalupe' to the right. Here you can see a close up of 'Little Miss Sophie'. Isn't it an adorable plant? 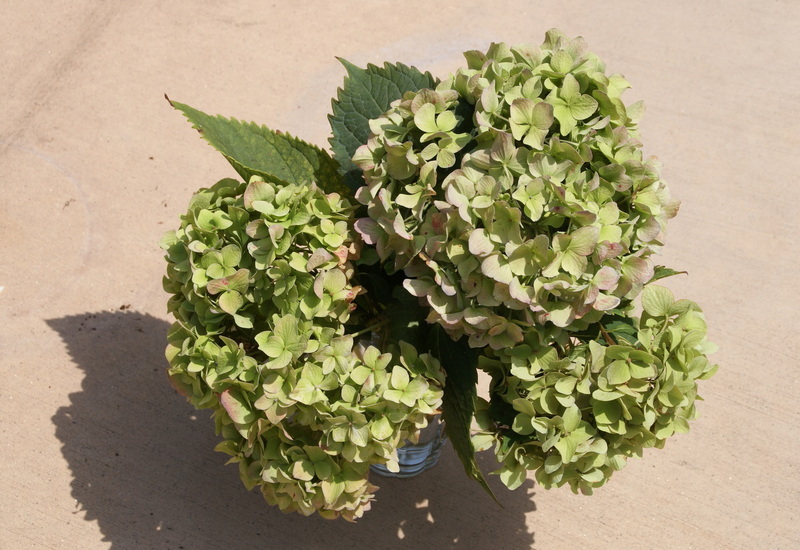 I also acquired a new hydrangea lately (see photo below). The variety is called 'Nikko Blue' and as the name says it is supposed to bloom blue. It looks pathetic, I know. It did not look very good in the first place, but then I drove it home in the car on a very hot day and the blooms got burned and fried during the ride. I am sure it will recover. You may wonder why I buy a plant that does not look good even at the vendor. 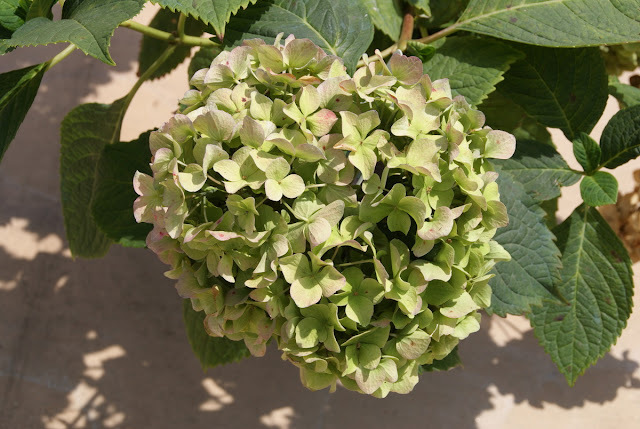 The reason is simply that I wanted a hydrangea so badly that day and after visiting three different places where most of them were sold out I settled on this one, because I think it is a good variety and even though it may be ruined for now, hopefully it will grow nicely soon. This is a close-up of one of its blooms. I love it when they are fading to green. Before planting I groomed the plant cutting of all the brown and green blooms and also the broken branches, which have been more than I initially had noticed. So we are down to this little guy now. At least I got some nice hydrangea blooms to decorate the house with! 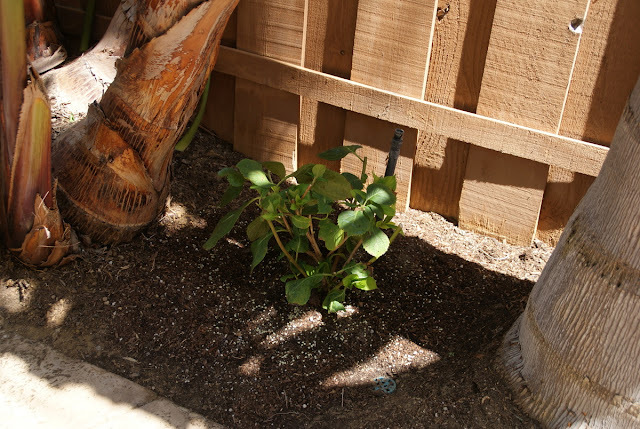 On the photo below you can see the hydrangea planted in its permanent spot in the backyard close to the garden gate. It is tucked in between a giant Streltizia Nicolai and a Queen Anne Palm. I hope it can withstand the root competition and grows there. 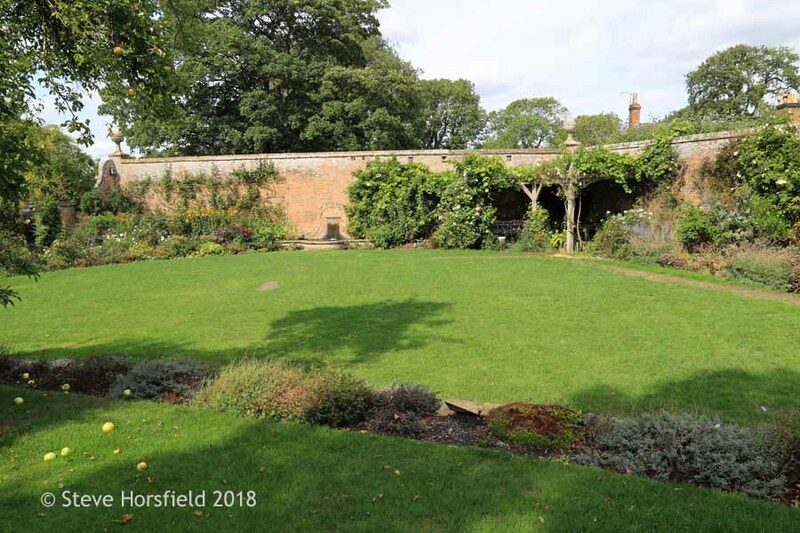 I think it can look quite nice in this garden location when it is a little bit more mature. 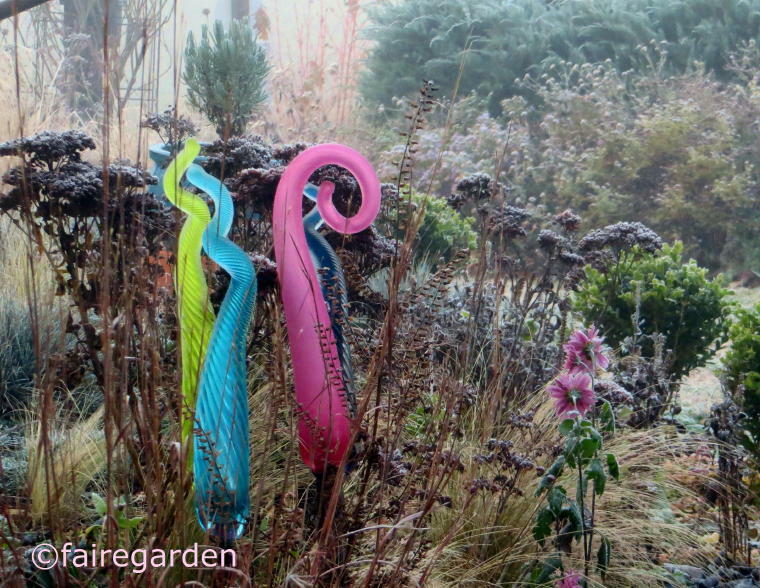 There are more news even though not directly from the garden but related to my garden blog. I recently took the leap and listed my blog on Blotanical, a garden blog finder. For me that is a big step to appear in a public garden blog directory, since I always question if my garden blog is interesting and good enough for people to read and follow, and even more so if my garden is worth it to write about and photographed, since it is still a very young garden and my husband and I are only moving forward in a snail pace to get it planted. Besides the heat (we are having temperatures in the upper 80's) some of my roses are blooming and have given me beautiful flowers for small plonks like the one that you can see on the photo below. Even though most of the rose blooms are a little smaller than usual I am very grateful for every cut flower that I can get! The little bouquet contains three 'Black & Blue' salvia flower stalks, one 'Sutter's Gold' rose, three 'Mister Lincoln' and four 'Charles Darwin' roses. All roses in this plonk come with a strong fragrance. They smell so good when you bring them into the house! The fragrance alone is enough to make me happy! So sorry, for your " Mme. Erest Calvat ". Hope the second rose will be ok . Love the little bouquet ! Your bouquet is gorgeous! Love the burgundy rose with that black and blue salvia. The cream roses give just the right amount of contrast. Lovely. I hope your Georgetown Tea loves its new home. It looks beautiful there. Sorry about your other rose -I hope you can revive it. And lastly, welcome to Blotanical. I love finding garden blogs there to read. I love your bouquet. Sorry about the loss of Mme. Ernest Calvat. I've lost 3-4 roses in the past year. That is always depressing to me. The Georgetown Tea looks wonderful in the new location. That hydrangea will surely come back for you. Your gardens and posts will most definitely be enjoyed by Blotanical members. I am glad you like Georgetown Tea, and thank you for mentioning me. I can't believe how much the rose has grown! You have been taking really good care of it. Dani, thanks for your comment. I am happy that you like my little bouquet! Holley, thanks for stopping by again! The color combination of the bouquet is almost a little bit too loud for me, but I guess summer has gotten to me! I am happy that you like it. Mme. Ernest Calvat looks even worse now than on the photo that I posted. I can't believe how quickly she declines. Flowerlady, yes, it is awful to loose a rose, especially such a beautiful one, sigh... I feel encouraged that you think Georgetown Tea looks good where I planted her. Wishing you a good start into the brand new week! Masha, thanks for visiting! Yes, Georgetown Tea has grown very well and I guess when I would have planted her earlier in the ground she would be even bigger already. I still love, love, love, the flower color. The pink stays pink, no apricot undertones whatsoever and the blooms are a pretty good size. I am still so thankful that you gave this rose to me. As far as Mme. Ernest Calvat goes, the root ball had the same size when I planted it and it didn't look awkward in any way, I think I saw even some white fresh roots growing into the new soil. What is wired, though, is that Ivy, the man I got the rose from also planted his rose finally into the ground and it died. I have no idea what is going on here. Yes, I put the pot containing Mme. Ernest Calvat into a part shady location. I have almost lost my hope that she will survive. When I think of her gorgeous blooms it makes me really sad. I love your arrangement--what a fun combination of blooms. And the capture of "Our Lady of Guadalupe" at the top is gorgeous! PlantPostings, thanks for visiting my blog and your kind words about my little plonk and the photo in the header of my blog! Whilst roses aren't exactly my first choice of plant, I do like and admire what you're doing with them in your garden! Don't worry about that hydrangea - they're tough little beasties and it'll grow back nice and strong - and in a few years it will have filled that space! Nutty Gnome, welcome to my blog! 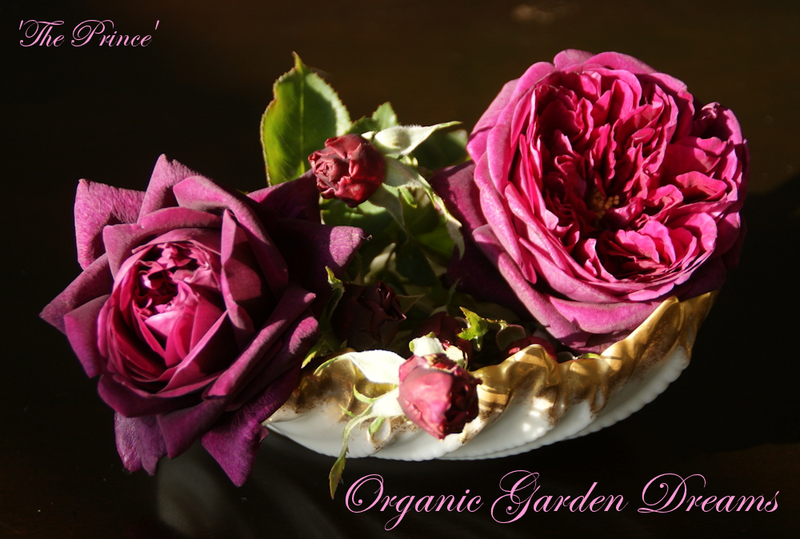 I am glad that you like my use of roses in my garden, even though they are not your favorite plants. Now, of course I am curious what are your first choice of plants. Hope your are right about the hydrangea, I really would love for it to become a big beautiful plant. Thanks for you kind words regarding my blog! You are more than worthy of your place here on Blotanical, I am enjoying your post now that I am following your blog. Keep it up! Martin, thanks for your encouragement regarding my blog, that is very nice of you! Your Georgetown Tea is absolutely gorgeous and looks just right for that location. That's so reassuring that it's already putting out new growth. Even at this small size I think it looks spectacular. Ingrid, thanks for stopping by! Yes, Georgetown Tea is doing well in its new location. I checked today on her and now she really starts to grow. I think it was the right decision to take Mme. Ernest Calvat out and put in Georgetown Tea instead. Can't wait until GT is flowering again! Hi Christina! I thought only fir trees were so mean to suffocate smaller plants. This is the problem I deal with. Very few plants grow happily under our huge firs. So, palm trees do such things too! I'm glad you found a rose which is strong enough to grow in that spot. By the way, what a great view you have there(the first picture)!!! Tatyana, thanks for coming over and leaving a comment! Palm trees are "our" fir trees. The root competition will be quite strong for the rose especially because the palms are planted in a half moon shape around it. If 'Georgetown Tea' can stand her ground only time will tell. But for now she has started to grow vigorously. You are right, we have a great view and I am grateful for that every day!